Afro-fusion 8-piece band K.O.G & the Zongo Brigade bring their debut album ‘Wahala Wahala’ to Band on the Wall. Under the guidance of the outrageously talented Ghanaian force of nature Kweku Sackey, aka K.O.G, and the whirlwind of energy that is Jamaican rapper Franz Von Song, the Zongo Brigade deliver infectious, high-energy West African grooves via Sheffield, drawing on afrobeat, soul, funk, rock, hip hop and reggae which has fast gained recognition in London and all over the UK. K.O.G’s signature mix of high-energy songs, raps, operatic vocal effects, along with the hard-hitting patois raps from the spirited Franz Von Song and a dedicated band of serious musical badmen, has led the band to perform on some of the biggest stages including Glastonbury, Reading and Leeds Festivals and numerous clubs and venues around Europe. Writing and composing the songs himself with a little help from the Zongo Brigade, collectively they felt that the best way to catch the energy of the band was to record ‘Wahala Wahala’ as live as not to lose any of its original musical combustion. Deeply rooted in stories from Africa, the album draws on love, peace and social issues. 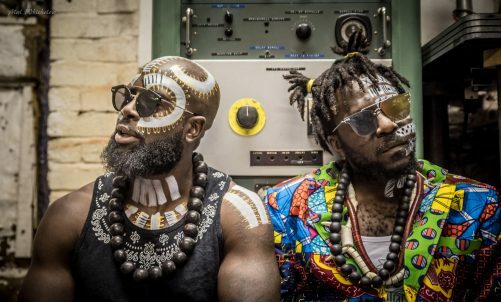 K.O.G & the Zongo Brigade’s motto “Unity in Diversity” stems from Kweku’s African origins and also embraces the eclectic mix of nationalities which make up the band.